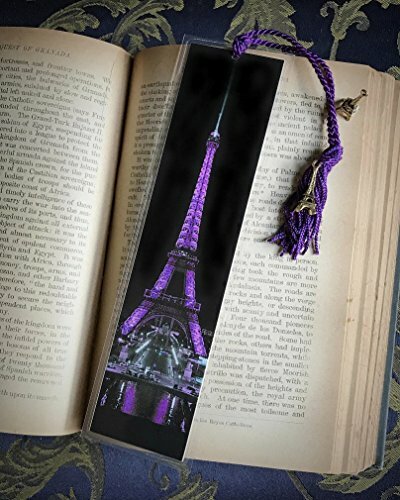 The Eiffel Tower in Purple Paris France Europe at Night City Lights Bookmark w/Gold Tone Tower Charm Fine Art Photography Photo Laminated Handmade Bookmark by JWPhotography Gallery at Tecac. Hurry! Limited time offer. Offer valid only while supplies last. Now available in 5 colors!! Please see all pics and read listing completely!! The perfect gift for all of the book reading loved ones in your life! Now available in 5 colors!! Please see all pics and read listing completely!! The perfect gift for all of the book reading loved ones in your life! Lovers of everything Paris will be thrilled over this! Your gift will be cherished for a lifetime! Please note: Please note everyone's monitor screens are different, so there might be a very slight difference to what you get. They look much better in person than on your screen and you will just love them!! Please see JWPhoto's other Bookmarks... Lots to choose from! LIKE THIS BUT PREFER IT IN A DIFFERENT COLOR? SEE THIS LISTING!! !